Fiddleheads (Matteuccia struthiopteris) are a springtime favourite not just for foragers, but also for purveyors of wild foods and restaurant owners. There are many fiddlehead farms in which they are grown for commercial purposes and this is a great thing. However, near major urban centres, far too many people are combing the woods decimating the fiddleheads all in the name of profits and not adhering to sustainable harvesting practices. There is about a two to three week window in which fiddleheads can be harvested. When this window of opportunity begins really depends on your geographic location. 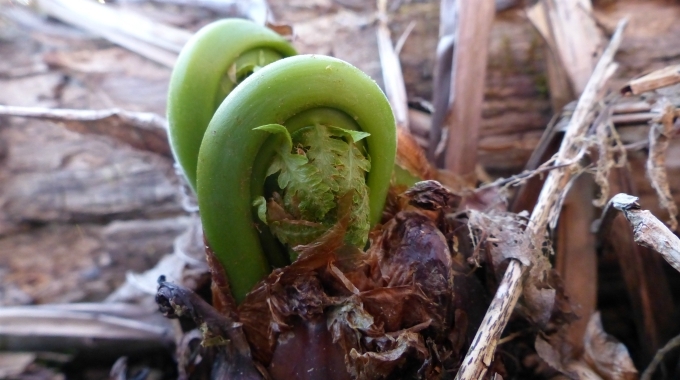 Typically, fiddleheads can begin to emerge anywhere from mid to late April into early June. Your best bet is to check out various locations on a weekly basis so you don’t miss the opportunity to gather fiddleheads. If you are not sure where to look, please click on the links below to two short videos that will help you. Fiddleheads should only be picked while still tightly coiled, and the short stem is safe to eat as well. They are best harvested at about 10 to 15 cm (2 to 6”) tall, when a portion of the tasty stem can be harvested, but while the fiddlehead is still tightly curled. Clean containers should be used to gather fiddleheads. When washing them, use only potable water; never use water from rivers or streams because you never know what is in that water. Be sure to refrigerate as soon as possible to ensure freshness. If you are new to foraging and are not sure how to properly identify the ostrich fern then be sure to click here to find out. Fiddleheads should only be harvested from healthy crowns that can sustain picking. These crowns should have at least four fiddleheads emerging from them. The presence of only one or two fiddleheads in a crown indicates low fern vigour or a newly established fern. Never pick from these. Harvest fiddleheads by snapping them off by hand or cutting them off with a knife. When cutting fiddleheads, take care not to damage the remaining fiddleheads. The fiddleheads that remain to grow into fern fronds will make food for the following year’s harvest. Research suggests that picking all of the emerged fiddleheads on a crown every year over a series of years results in the decline and often death of the fern. It is really important to remember that picking no more than one half of the emerged fiddleheads from each crown is important. Should there be no follow-up harvest of later-emerging fiddleheads (from the same crown) in the same season, then this is considered to be sustainable. While out there foraging be sure to remember these helpful tips so that there will always be fiddleheads for you and others for many years to come. Love fiddleheads! So worth waiting for after a long winter!!! Love your writing too – you rock! Oh my – thank you! Fiddleheads are tasty!